Chicken Alfredo Bake is EASY WEEKNIGHT DINNER CASSEROLE version of family favorite Chicken Alfredo. Cheesy, white sauce chicken Parmesan pasta is delicious, warm comfort food for cold winter nights! If you don’t have too much time to cook, then you should also check Cheesy Chicken Enchilada Casserole ,Chicken Parmesan Casserole and Easy Crock Pot Teriyaki Chicken! Comfort food simply doesn’t have to take hours and hours to prepare. Moreover, all these casserole recipes could use rotisserie chicken or shredded chicken, instead of freshly baked or cooked, and taste great, too. So, I make any of these casserole, anytime I had some leftover chicken to use up. Anyway, easy weeknight dinner casseroles with chicken are my favorite recipes for busy nights. 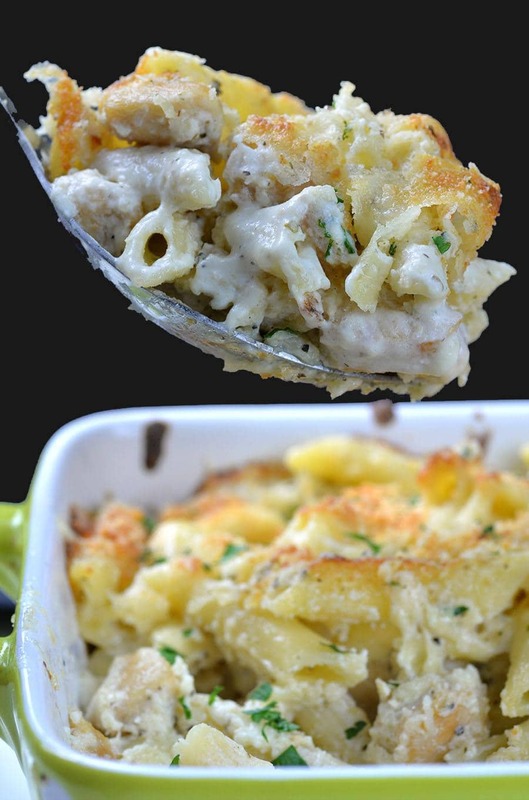 And, especially this Chicken Alfredo Bake recipe! Everybody in my family love to have this for dinner. And if you have some picky eater at your home, I’m sure that this Chicken Alfredo Bake will satisfy them, too. It’s cheesy pasta with white meat, and there’s nothing not to love about it! Moreover, homemade Alfredo sauce with Parmesan is super easy to make and taste way much better than the one from a jar. It’s very rich, creamy and buttery and you can finish it up while waiting the pasta to cook. Also, when you cut the chicken breast in bite sized pieces, it will cook in a blink of an eye. 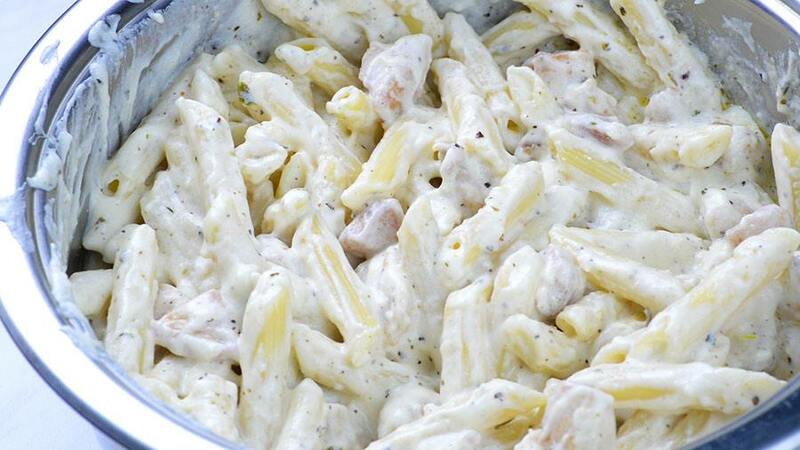 Finally, stir together cooked pasta, chicken and homemade Alfredo sauce and place in a casserole dish to bake. But, to make super cheesy, comfort food dish for these cold nights, add shredded Mozzarella cheese and extra Parmesan on top. It will bake in cheesy pasta perfection. 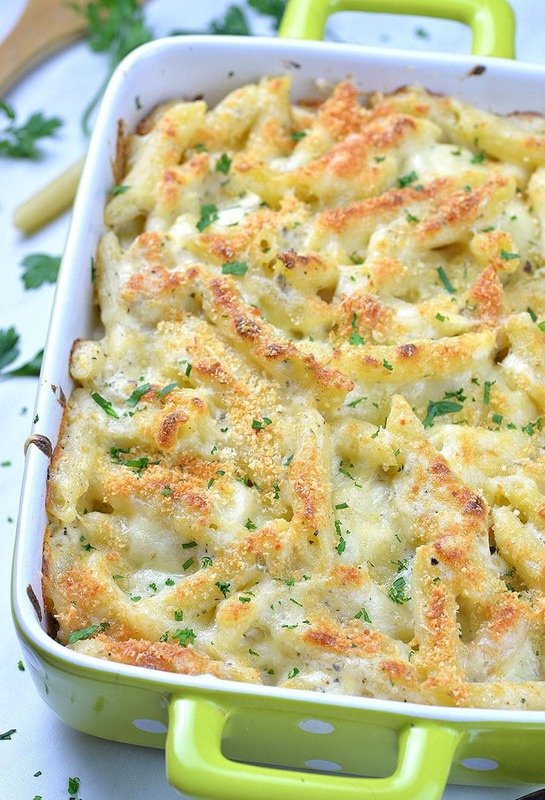 This Chicken Alfredo Bake is total crowd pleaser! Who doesn’t love Pasta or Chicken Alfredo?! When you combine these two favorite dishes in one, you’ll get the best casserole ever! Also, you can serve it with green salad and have a complete dinner ready at your family table for less than an hour. This easy, cheesy pasta casserole recipe promises to become a family favorite, so keep it!!! Cheesy, Chicken Alfredo Bake is EASY WEEKNIGHT DINNER CASSEROLE version of family favorite Chicken Alfredo. Preheat the oven to 400 F and spray baking dish with non-stick cooking spray. Cook the pasta according to the package directions. The pasta should be cooked al dente. 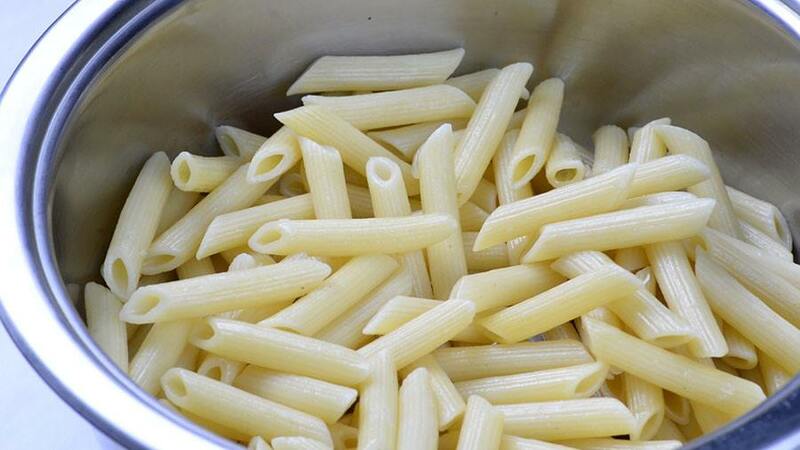 Drain cooked pasta and RESERVE PASTA WATER if needed later to thin the Alfredo sauce. 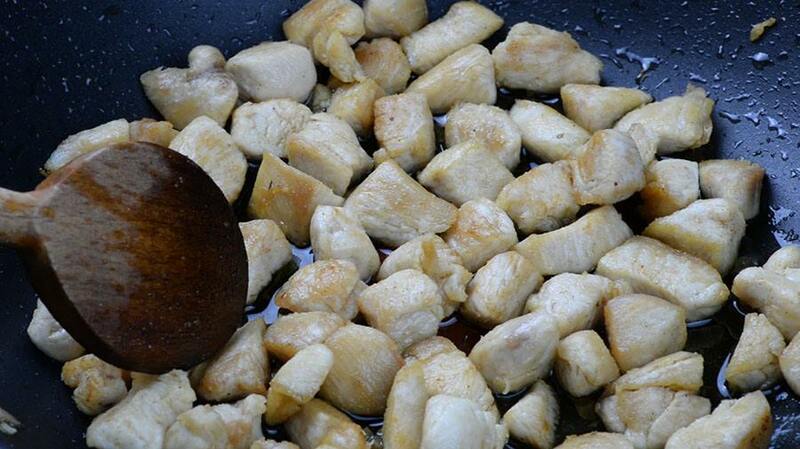 First, chop chicken breasts in bite sized pieces, then season with salt and pepper to taste. Grease the pan with about 1 Tbsp. olive oil and heat over medium heat and place copped chicken in the pan and cook about 10-15 minutes or until cooked through. Transfer cooked chicken onto cooked and drained pasta. To make Alfredo sauce, in a pan melt the butter over medium heat, then add flour and whisk to dissolve. Next, add minced garlic and cook for 1-2 minutes whisking constantly, until all gets nice golden color. And be careful, do not burn the flour and garlic!!! Then, gradually whisk in milk until smooth and free of lumps. Gently whisk in heavy cream. Add cream cheese and whisk until completely melted. Next, whisk in Italian seasoning, salt and pepper. Finally, add ½ cup of grated Parmesan. Bring the sauce to a simmer and cook 3-4 minutes until it starts to thicken (gently whisking all the time). If the sauce became too thick, you can thin it out using reserved pasta water. 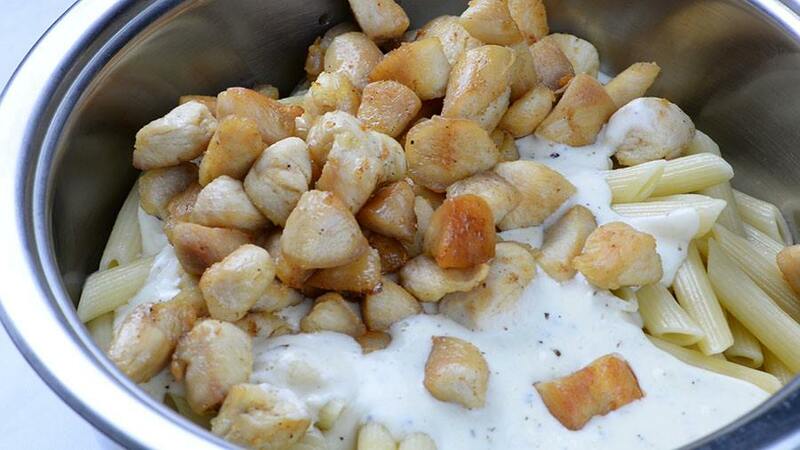 Add Alfredo sauce to cooked pasta and chicken and stir to combine. Spread about half of the mixture in the baking dish, sprinkle with about ¾ cup of shredded Mozzarella cheese, then spread remaining pasta mixture, sprinkle with remaining Mozzarella and 1/3 cup of grated Parmesan. Bake about 15-20 minutes until the top gets nice golden-brown color.